Our professional installers have installed countless home renovation and new construction doors for our wonderful clients! Our installers in Medicine Hat Alberta, Regina Saskatchewan and Swift Current Saskatchewan travel hundreds of km's to surrounding communities to install entry, garden & sliding patio doors. 1. Select a door style that matches your personal tastes. Your home should be a reflection of your unique tastes and the entrance is where it all begins. When you are deciding on an entry door system consider the overall appearance of your home – modern vs. traditional design, colour schemes, wood and hardware finishes. 2. Select your door material. Prestige offers door slabs in two different types of materials: • Woodgrain Fibreglass gives your door a rich wood appearance but it won’t crack, swell, rot or dent. • Smooth Fibreglass provides a clean, flat surface perfect for painting and a tough, maintenance-free exterior that won’t dent or ding. 3. Select your door configuration and options. Choose a single entry door with one sidelite or go with a full double door, two sidelites and transom to create a masterpiece for your home. We allow our customers the freedom to customize their entrance with an in or out-swing to maximize space, then select hinge and striker plates that match a home’s finishes. 4. Select decorative door glass design. Showcase your home with decorative glass! Prestige offers one of the largest offerings of decorative door glass selections in western Canada. Choose from our unique decorative glass collections and truly let your imagination run wild. The options are almost limitless. 5. Select a stain finish or choose to paint. The environment around us is full of inspiring colours. Whether your preference is muted or bold, choosing any of our offered colours for your Prestige doors will ensure your project design makes a lasting first impression. We can also create custom colours to make your door anything except ordinary. Your project is a reflection of your unique style, and adding a little curb appeal with splashes of colour can go a long way in expressing that style. Prestige offers a diverse selection of quality sliding doors in many configurations sure to meet your project requirements. All Prestige Symphonie patio door systems feature double insulated tempered glass, giving you a reliable and secure entrance. This, combined with smooth functionality and a clean and open look are just a few of the reasons our customers continue to use patio doors for renovations and new home construction. 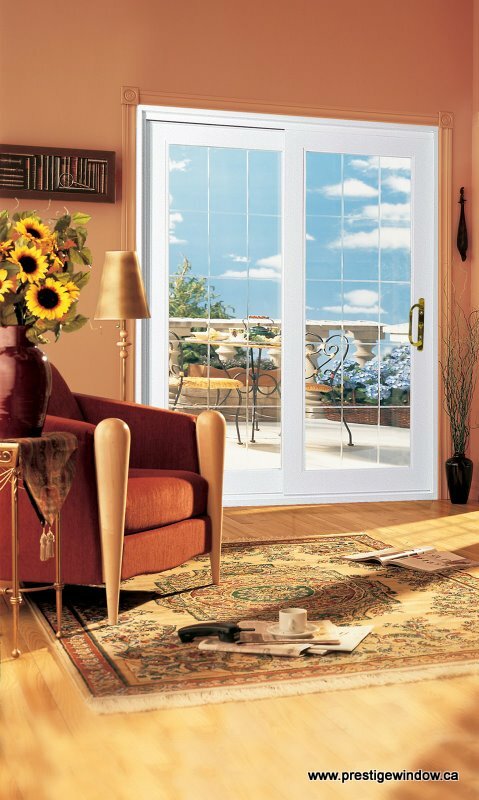 All Symphonie patio door systems offered by Prestige Window & Door are a great way to connect your home with the outdoors. It’s time to open up your living space. Sliding patio doors include a screen on the outside. This screen locks out bugs, animals and debris while allowing the scents, sounds and breezes from outside to pass through. Because sliding patio doors can expand to greater widths than hinged doors, they allow much more air to pass through on a breezy day. Keep in mind the location of the door on your house. If it will be unprotected on the north or west sides of the house, you'll want to choose weather-resistant materials for the frame and tempered, insulated glass. Pick the glass style according to the amount of sunlight you want transmitted to the inside of your house. PlexiDor Extra Large For dogs up to 220lbs The panels on the PlexiDor XL Door and Wall u.. This Product has Free Shipping! PlexiDor Door Sizes .. This Product has Free Shipping! PlexiDor Door Sizes S..
PlexiDor Wall Series Professional Quality, Fit, and Finish PlexiDor Wall Series includes a.. This Product has Free Shipping! PlexiDor Door Sizes Sma..